You are here: Home / Avoiding Accidents or Minimising their Effect / If you were not wearing a cycle helmet can you still claim for personal injury? 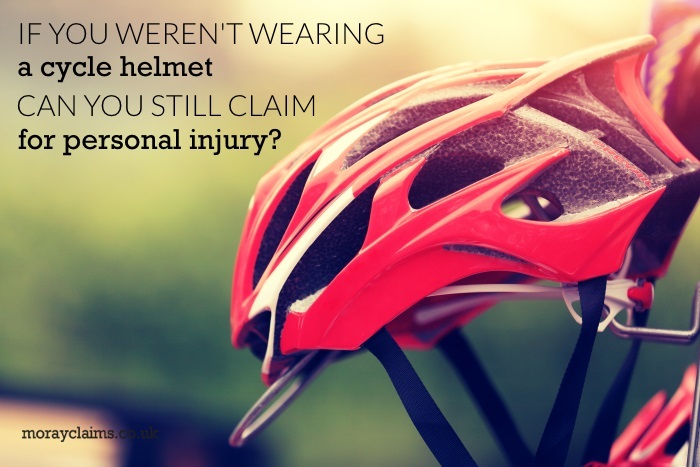 If you were not wearing a cycle helmet can you still claim for personal injury? The law in the UK does not require pedal cyclists to wear a helmet. What this means is that you won’t be stopped by the police if you fail to wear a cycle helmet. You won’t be prosecuted under the criminal law. On the other hand, Rule 59 of the Highway Code categorises cyclists as vulnerable road users and advises that cyclists ‘should wear a cycle helmet which conforms to current regulations, is the correct size and securely fastened’. The Highway Code is relevant to both criminal and civil law. Claims for personal injury compensation are civil claims for damages, so the Highway Code is relevant. Many cyclists ride without a helmet. Only just over a third of cyclists using major urban roads wore cycle helmets, according to research findings of the UK’s Transport Research Laboratory in 2008. Equivalent research in Germany apparently showed that only 11 % of cyclists in towns and cities wear a cycle helmet. Cycle helmets have to comply with a European standard. This stipulates that helmets must withstand a test simulating the head striking a flat surface at 12 mph and a kerb at an impact speed of 10 mph. These parameters tend to suggest that a cycle helmet will make a big difference to the outcome (to your head) if you hit a stationary object and go over the handlebars. A helmet might offer your head a lot less protection if, say, you are struck by a car going at 30 mph. Failure to wear a cycle helmet will not prevent you having a claim. We are back to the issue of contributory negligence which is something we have considered in other articles in a variety of contexts. This is where the injured person’s own conduct – active or passive – is regarded as contributing to their injuries. The law can reflect the injured person’s share in the blame for the injuries by means of a percentage deduction from the compensation. As an example, a claim worth £1,000 on full liability (100%) would only be worth £750 if there is 25% contributory negligence. It is up to the person at fault for the accident to argue and prove that the wearing of a cycle helmet in the circumstances would have reduced the injuries. Given the parameters mentioned above for cycle helmet safety performance, above a certain speed of accident, it won’t be possible to prove that a cycle helmet would have made any difference to the outcome – in which case the failure to wear a cycle helmet will have no effect on compensation. You will the full value of your claim. In reported decisions from the courts, there are examples of judges refusing to make any deduction for contributory negligence because they could not be satisfied that a cycle helmet would have improved the injury outcome. There may well prove to be a parallel with seat belt cases in this area. The law on contributory negligence for failure to wear a seat belt dates from the 1970s. At that time, while it was known that a seat belt would probably lessen the injuries sustained in any road traffic accident, it was not a legal requirement to wear a seat belt. The same can probably be said for cycle helmets today – i.e. not a legal requirement but known to be a good idea to wear one. Where it would have made no difference at all (e.g. because the person did not suffer a head injury on it was a collision where the probable speed was beyond the design limit for a cycle helmet) there will be no reduction. In other words, the person will receive full compensation. Each case is unique. Get advice. alleged failure to display lights on the bicycle. Failing to wear a cycle helmet will not, in itself, prevent you having a claim for personal injury compensation. It may lead to a finding of contributory negligence against you. But it is up to the other side to prove that wearing a cycle helmet would probably have made a difference to the level of injury you sustained. In the average case, the maximum level of contributory negligence for failing to wear a cycle helmet will be 25%. That’s where a cycle helmet would have prevented the injuries completely. There is an intermediate possibility at 15% – where a helmet would have lessened the extent of the injuries. If the cycle helmet would probably have made no difference to the extent of the injuries suffered – and we have looked at the fact that cycle helmets are only designed to provide protection at relatively low impact speeds – there won’t be any deduction for contributory negligence at all. But the bottom line is: get specialist legal advice about the whole circumstances of your accident. An accident scenario, on the face of it, may look to be one where some concession for contributory negligence will need to be made. However, properly analysed, there may be a way to eliminate contributory negligence as a possibility – or at least reduce it to a lower level than you originally thought. We hope you have found this article – about whether or not failing to wear a cycle helmet affects your chances of claiming successfully for personal injury compensation following a cycling accident – to be a help. If you have any questions about matters raised in this article, please get in touch with us. Your questions can also help us to improve the content on the website. You can contact either of our personal injury solicitors – Marie or Peter – via 01343 544077 or send us a Free Online Enquiry.